Battery Dance Company performing Inter/Ago. Photo by Darial Sneed. BOTTOM LINE: No other NYC dance company hosts an ethnic dance festival representing over six different countries while serving up views of the sun setting over the Statue of Liberty for free. 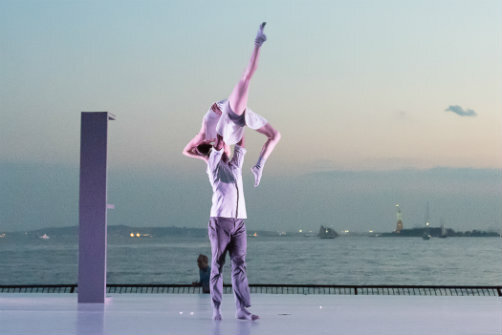 From looking around the audience, one can see that this festival has achieved its mission to unite the locals, tourists, dance aficionados, and newcomers to the art form as the sun sets over the Hudson River. The energy was electric as Indelible Dance, directed by Robin Cantrell, started off the evening with an excerpt of Wonderland, a pulsing group piece choreographed by Sean Scantlebury in which the dancers use their classical lines to make aggressive capoeira-like strokes through the air. They are the perfect balance between stiff and fluid as their arms slash across the Hudson River in the background. A peaceful and precise male duet by Asia Duo called Draw-eer was next one on the program I saw. Fairul Zahid and Yachao Zhu, dancers from Malaysia and Beijing, layer their own contemporary influence over their background in Asian folkloric dance proving that the sum equals more than the addition of its parts. Tenderness was then brought to the stage by Battery Dance Company's duet Terra and Astra. Sean Scantlebury's duet is sweet and sinewy as this long limbed couple would twist around each other like a pretzel and then unwind into a long elegant lift. Cantrell's lines go on for days. The emotional range to this duet is genuine and therefore very powerful and moving. During the 2015 festival, Battery Dance Company also presented two companies in their US premieres—the Columbian company Sankofa Danzafro and the Polish Dance Theater. Sankofa Danzafro's La Cuidad de los Otros is politically relevant with its tension in urban city life. This company's mission is to bring together Afro-Columbians and Columbians. As one person is shunned from the group at points, this piece clearly demonstrated the physical and emotional divide that some Columbians might face, a potentially universal message as they transcend all with celebratory dance moves. These steps are based on African dance tradition and the dancers seem to move so fast they could light the stage on fire with the heat of their feet. Live musicians complemented the recordings. The Polish Dance Theater's It's Already Dusk, by Ewa Wycichowska, was the most cinematic piece of the evening. In this piece, the ominous figure of death promenades the stage on stilts as dancers joyfully trot around him without really seeing him. The piece is an interpretation of Ingmar Bergman's The Seventh Seal, in which a medieval knight duels with Death. Wycichowska's piece is well-crafted and easy to understand even if you haven't seen this film. Battery Dance Company closed the evening out with a world premiere by Graham dancer Tadej Brdnik called Inter/Ago. This dance met the sunset overhead with drama and beautiful ensemble dancing. The company has never looked better and more cohesive as a group as they flowed from duet to solo to trio. The benches are used architecturally as they are stacked on their sides and then lowered onto their feet and used as platforms for the dancers. I couldn't think of a better way to spend a Sunday summer evening than to be at the waterfront watching such a varied array of dancing. It is a true celebration of New York City and of the dance world uniting to enjoy its spoils and to welcome new eyes and ears into the art form.